Over in Nintendo land all the cool kids are raving about some game that lets you catch a bunch of cute little monsters and do battle with them. Here on the PC we’ve got something a bit similar, except our monsters are neither cute nor little. Ours are bloody great dragons with massive gnashers, strong enough to rip a man in two. They also double up as winged steeds and – provided you’re nice to them – might become a companion for life. Monstrous flying lizards are at the core of Dragon’s Prophet, a free-to-play MMORPG that looks more towards creating your own fire-breathing army than dungeon raids and PvP. Genre purists need not fly away though; all that stuff is still firmly a part of Dragon’s Prophet’s foundations. This isn’t just an MMO for dragon fetishists. So what makes up an epic tale of a boy/girl and their dragon? Here’s everything we know. You’ll be taking on the quest to become the Dragon’s Prophet (think a Dovahkiin for the MMO world), a human that will help keep in tact the fragile peace that has settled over the world of Auratia after the horrific Dragon Wars. To gain that title though, you’re going to have to gain some kind of affinity with the beasts that wander every corner of the game’s open world. There are over 300 different species of dragon, and your mission – should you choose to accept it – is to capture every single one. Perhaps that’s asking a bit much, but you’d do well to snag yourself at least one of each type. Dragons are broadly sorted into three different categories: Air, Land and Aquatic. You’ve got your timeless airborne classics in the Air type, but you’ll also find some tumblring tank-like beasts to add to your gang of ghastlies in the Land types, and the crocodile-like Aquatic beasties most at home in the lakes of Auratia. Each type mainly offers a transportation and combat bonus; Air allows you to fly and strike from the sky, whilst Aquatic types allow you to cross oceans and launch beach attacks D-Day style. Dreamworks’ animation studio may like to depict dragons as friendly pals, and whilst that may be eventually truth in Dragon’s Prophet, every player’s first move with a dragon is pretty hostile. If you were a large-mouthed, armoured bird-lizard, would you want some high-and-mighty human telling you what to do? Of course not. So dragons need a bit of convincing before you can take them on as adventuring companions. This is achieved through a mini-game clearly inspired by the southern United States family favourite ‘bucking bronco’ activity. Jump on a dragon’s back, hold on for dear life, and pray he takes a shine to you before you get flung off. Dragon’s Prophet is developed by Runewalker Entertainment, a studio most famous for Runes of Magic. That game was often put down for sharing a little too much in common with World of Warcraft. Dragon’s Prophet makes it own mark with a much more dynamic, action-focussed combat system that combines the skills of your player character with the abilities of their dragon companion. The click-to-slash and combo-chaining battles taste a little of TERA, but bringing a dragon to the party gives Dragon’s Prophet its own flavour. Your character can be one of four broadly familiar classes: Guardian, Ranger, Oracle and Sorcerer. They’re all built for fluid, DPS-heavy fighting, and only glance briefly at the ‘Holy Trinity’ of tank, healer and DPS so well established in MMO culture. Instead of relying on a teammate to keep you healed and buffed, you’ll be looking to your scaly friend for a HP boost, who at the same time can be standing stalwart as your tank. Leveling up your character’s Charisma will build your bond with your dragons, and the better that bond, the more abilities your dragon will be able to unleash. Having a dragon by your side has several obvious advantages, the main one being that you’re next to untouchable compared to normal folk. Perhaps dragons are OP, but we’re okay with that. What this means for you though is that Dragon’s Prophet is one of the most solo-able MMORPGs around. If you crave the hustle and bustle of an MMO but don’t have the schedule to fit in with friends, or would just rather that people left you the hell alone, then having a dragon with you makes all of Dragon’s Prophet’s quests perfectly completable on your lonesome. Even dungeons can be scaled for solo play, lowering the difficulty a tad to ensure you’re not too overwhelmed. Of course, Dragon’s Prophet being an MMORPG, it’s kind of a requirement that social elements report for duty. 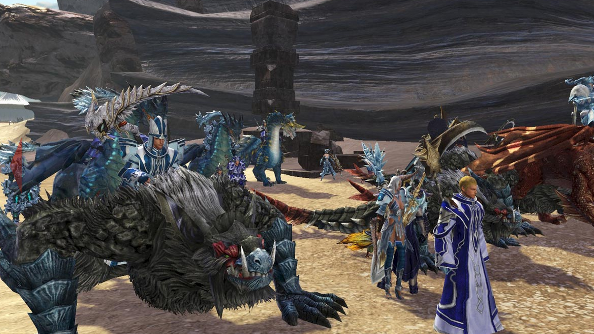 Not only is it a scientific fact that questing is far more fun when joined by other players swooping in on their own dragons, teaming up will allow you to tackle the Guild Wars 2-like public events, which grant showers of XP and some neat loot. Joining a guild will not only offer you a pre-ready roster of friends to quest with, but will also open up the end-game, which offers arguably Dragon’s Prophet’s most unique feature. Other than the obvious titular monsters. The Frontier System is Dragon’s Prophet’s high-concept PvP end-game solution. Guilds clash on the fields of battle to both prove their worth and capture new territory, expanding their empire over the numerous islands of Auratia. But there’s something a little different to this PvP. The land you’ll be fighting in is entirely player created: plots of land are bought and upon them houses, castles and monuments built. Everything you can see is someone’s home, their pride and joy. What better place could there be to commit mass murder in? You can build and furnish your house with Sims-style precision, but from the moment the first brick is laid, it’s in danger of being ransacked by genocidal enemy guild members. Since the furnishings in your abode can be brought with real cash don’t worry about it being destroyed by careless looters, but do know that despite the warm community that lines the streets of your guild’s village, every moment is an opportunity for enemy agents to strike. Battles in the housing districts are the prelude to the main event. The winning guild can schedule a capture-point game for the next day, which will be instanced on the island the guilds are warring for control over. This allows time for both sides to rally forces and prepare defences, which include monstrous siege weapons. Whoever wins this battle gains control of the island, which is a massive benefit both in resources and finance. A member of each guild is designated the High Lord, and it is their job to manage the empire. This naturally means being the tax man and collecting gold from the residents of your conquered lands. The High Lord can also organise events in territories, which we expect will go down much better than demanding taxes. Dragon’s Prophet is available to play right now by signing up at the official website and downloading the free client.